Munich – Most of the FC Bayern München star ensemble trooped silently past the assembled press and headed straight for the dressing room in the wake of Saturday's workmanlike 2-0 home victory over cellar-dwellers Eintracht Braunschweig, which keeps the defending champions three points clear of closest challengers Bayer 04 Leverkusen in the standings. Even the normally effervescent Thomas Müller, while pausing to chat in the media zone in the catacombs of the Allianz Arena, did so only to briefly and soberly acknowledge the importance of the win and that the past few weeks have, indeed, been strenuous, with a packed and demanding schedule for both club and country. 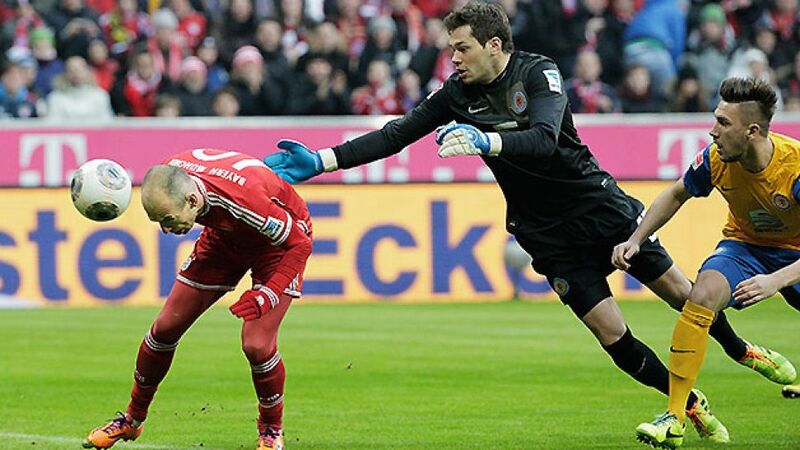 One Bayern player seemingly immune to any semblance of fatigue at the moment, however, is Arjen Robben. On the contrary, the Dutch international was positively beaming after bagging the brace that secured Bayern their mandatory victory and he took the opportunity to praise his employers to the skies as well. “Statistically, I've done my best work at FC Bayern. I just feel really good here,” Robben said after a contest in which he himself had provided the moments to remember inside the opening half-hour. The deadlock-breaker came with just two minutes on the clock, following a delicate chip from Mario Götze and a one-two with the post, the “two” being a rare header on the rebound. His second goal, on 30 minutes, was a more typical cut-in-and-finish from the right, Toni Kroos with the assist on that one. In fact, the biggest problem Robben had in the first half was not with the Braunschweig defence, but with his own celebratory knee-slide after the early opener, which turned into an abortive forward roll that momentarily set the alarm bells ringing among fans and head coach alike. “He's not been injured yet, touch wood,” said Pep Guardiola, naturally well aware of Robben's long history of enforced spells on the sidelines. That they duly did and, not for the first time recently, the 29-year-old rose to the occasion in the absence of his counterpart down the left, Franck Ribery. A fractured rib kept the French wing wizard out of the summit meeting at Borussia Dortmund and the UEFA Champions League trip to CSKA Moskva as well as Saturday's game against Braunschweig and Robben scored in all three games to help the men from Munich to victory. That in itself, however, is no more than an extension of his current form: 12 goals and 11 assists in 19 competitive outings makes for pretty impressive reading. Indeed, no other Bayern player has been directly involved in as many goals this season. The statistical record he himself alluded to meanwhile takes on an even greater significance in the context of the club's all-time annals. Since swapping Madrid for Munich in the late summer of 2009, Robben has averaged a goal every 125 Bundesliga minutes for the record champions. Only Gerd Müller (one every 105 minutes), Mario Gomez (113 minutes) and Marcio Amoroso (BVB, 124) can boast a more effective return. And given that all three were/are classic out-and-out goalgetters, that makes Robben the most efficient scoring midfielder in the history of FC Bayern – and the Bundesliga. Not that the nifty winger was taking that, or the fact that he had marked his 90th appearance with top-flight goals number 50 and 51, as any kind of grounds for self-promotion. Robben may occasionally have fallen foul of critics for displaying a touch more egotism than is the accepted norm in the modern top-level game, but there was not a hint of that to be found in his simple parting message: “Credit to the team, we played really well – especially in the first half.” And off he went, still beaming.